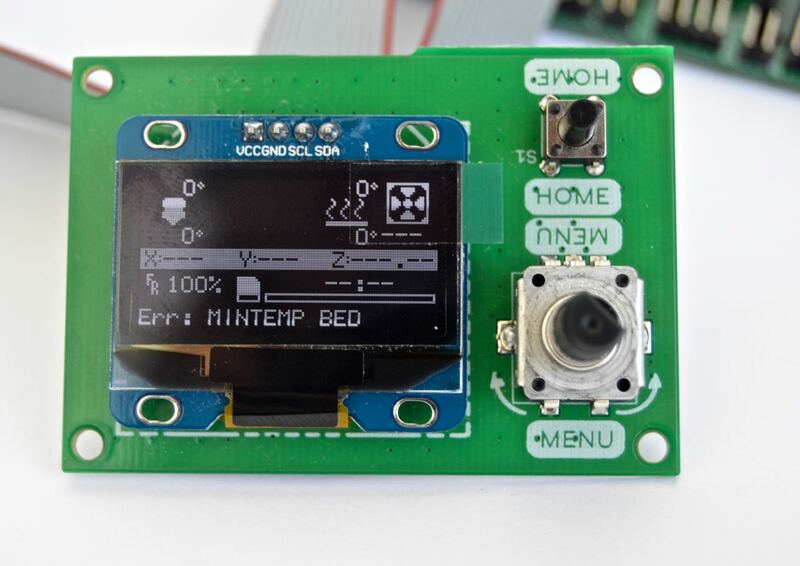 The SAV OLÉd is a 1.3" graphical OLED LCD with rotary encoder with click button and 1 push button to control your 3D printer or gadget. 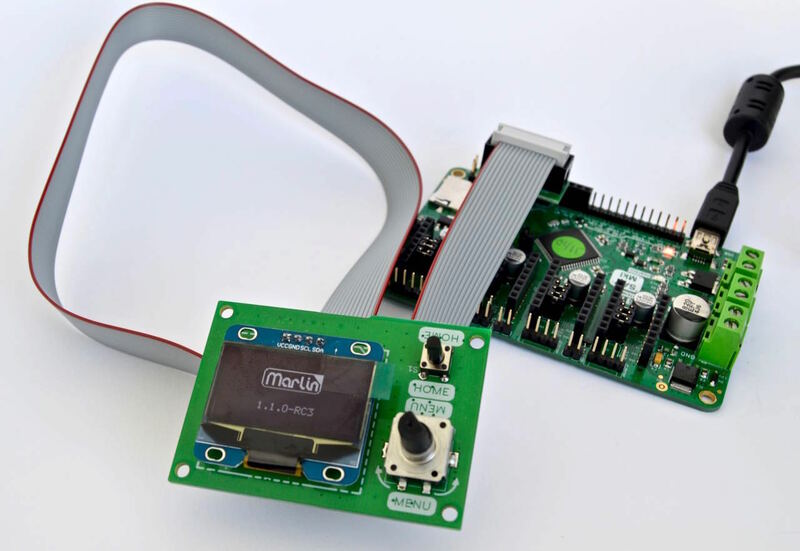 It allows the control of a 3D printer running Marlin firmware and a SAV MkI, sanguinololu, printrboard or similar electronics directly without having to have a computer connected. Standard features are provided by marlin firmware, all of which are fully operational: start and stop prints, control print speed while printing and change many calibration settings - saving these to the AVR’s EEPORM so they are persistent if you turn the printer on and off -. 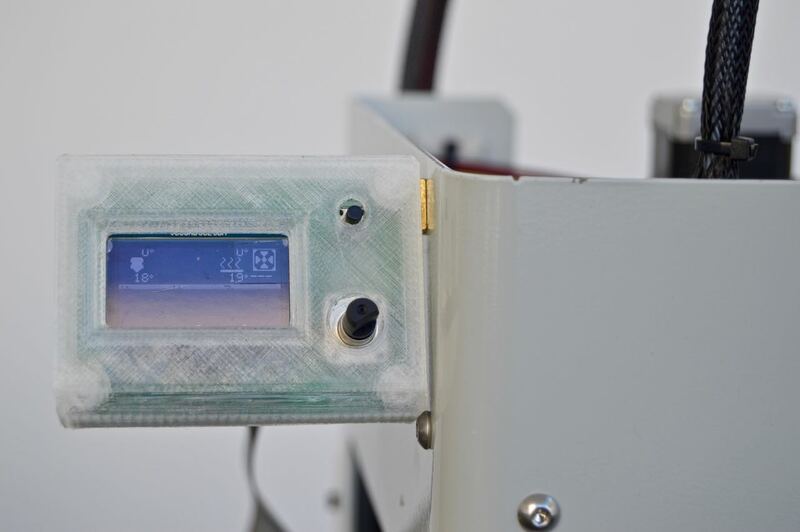 The design also counts with an enclosure box that can be mounted on your printer. You can download it for the following link: enclosure. 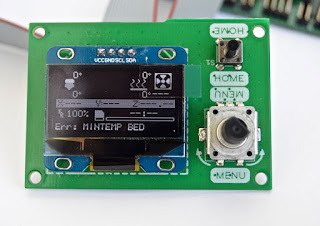 This module does not have an SD reader as this feature is provided by the SAV MkI, making the LCD interface more reliable and glitch free. 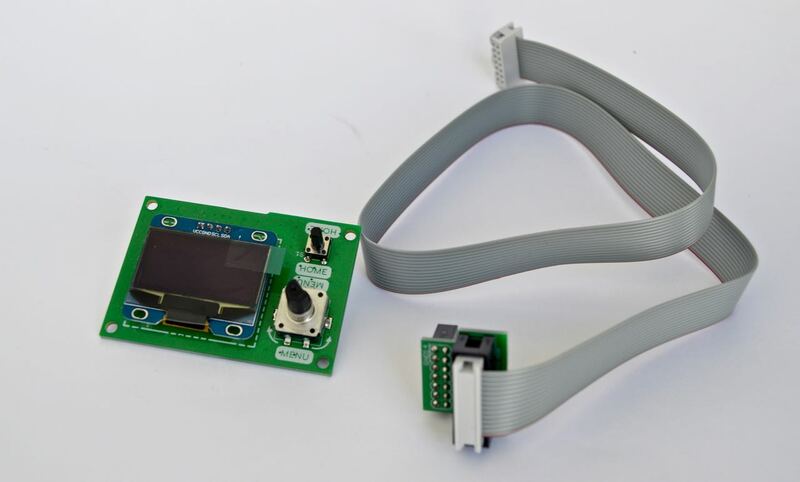 The LCD module comes with an expansion module to connect directly to the SAV MkI. It connects to the main controller using a 14 wire ribbon cable using a 3M box connector. The LCD has been tested with a 1.5m ribbon cable without glitches. Rotary encoder with push button, filtered to improve reliability. Push button for HOME (functionality can be changed by firmware). The entire assembly has been throughout for right and left handed. 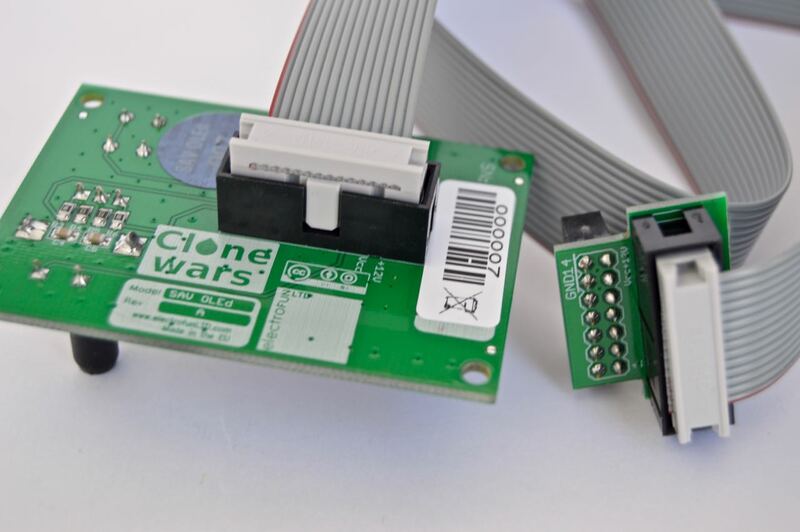 Simply reconfigure the firmware and rotate your LCD. How convenient is that! Please refer to its documentation in the RepRap wiki page (link). Released under the CC SA-BY. Our AVR line is an open-source Arduino-compatible project. We have thought of a line of small development boards that are fully compatible with the Arduino development environment. These boards are ideal for projects; with a small footprint but with the same performance as regular Arduinos. The idea here is to make available the Eagle files you would need to make your own board variants and if you don't want to go through the hassle you can always order them from us. We would also like to hear and see where these designs have gone into or any derivative work made from them. So please, keep us posted and we will share it with the community. While Arduino is a protected trademark, the name of our AVR line can be used freely and has an unrestricted license to use. These boards have been inspired by the Creative-Commons 2.5 licensed Arduino reference design (please refer to the schematic file for attribution information). Boards are licensed for any use ( hobbyist, commercial, non-profit, etc.) under Creative Commons 3.0 Attribution-ShareAlike (CC BY-SA). None of the board names are registered, but we encourage you to use it in any case and provide credit to the source. CC3.0 requires you to maintain attribution to the people before you on the schematic, board files and any derivative work you do with them. You don't need to give attribution on the physical proucts that you might make with these files, but we would appreciate it. electroFUN LTD. Simple theme. Powered by Blogger.